The album features original music composed by Frederik Wiedmann (Hostel: Part III, The Hills Run Red), for which he earned his first Annie Award nomination. Based upon the DC Comics super hero, Green Lantern: The Animated Series follows Earth’s Green Lantern, Hal Jordan, who is used to being in dangerous situations — but he’s never faced anything like this! Set in the farthest reaches of deep space, the series finds Hal on the Guardian Frontier, where he must face down an invasion from the Red Lantern Corps. 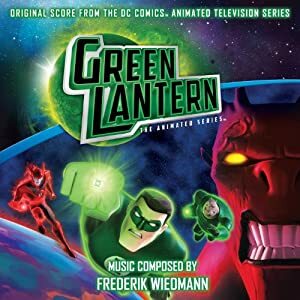 “The score for the Green Lantern series is a big and epic orchestral score, filled with themes and world instruments,” said Wiedmann. “Since most of the story takes place in space, the musical possibilities are endless. I get to write a blend of sci-fi, heroic action, adventure, utilizing all kinds of worldly instruments. It is a rare opportunity for a composer to have this much variety in creating music for one project.”. With 36 tracks of music on the CD, this is one fans can’t afford to miss. You can pre-order your copy by clicking here. The soundtrack will be released August 21st, just a week before the first season DVD on August 28th.